It’s 11:30 and the post I’m working on simply isn’t flowing. So, instead of just waiting until another time like I normally would, NaBloPoMo insists that I post something. So here’s the One Word Meme that I blatantly stole from Stephanie. I’ll post again first thing in the morning…well after I sleep in and have had some coffee and…well… sometime tomorrow! This entry was posted in Blogging, Family, NaBloPoMo. Bookmark the permalink. Seeing this picture of your father, reminds me that this is the picture that you use to kiss on and try to carry around before you were a year old. He was in Wes Pac and it was my way of keeping him in front of you, so you wouldn’t be terrified of him when he came home. It was a 8×10 in a wooden frame. Thank you all of you military men & women, past and present. I salute you. I did this one not too long ago. It’s surprisingly hard to keep the answers to just one word. One word answers?? Oh boy that would be torture. And yes, yes your father was definitely handsome! Mom~I’m not sure where this picture came from, it’s just in my files. I think it’s from a wallet size one. Maybe that’s why I always love this particular picture, I think it’s my real dad! Jay~I agree…apparently I’m a blabber mouth! Yes your Dad is a handsome fellow! Hope you don’t mind but I stole this for my lame post today lol! I love the photo of your dad. 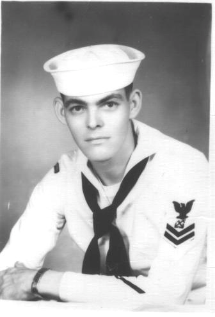 My eldest brother was in the Navy. And what did your poor hubby do to be banished to the dungeon? there is just something about a man in uniform.